Project Baseline study participants Anna (left) and Justin (right). Although they live nearly 3,000 miles apart, strangers Anna Brooks and Justin Dennis are sharing an extraordinary experience. Justin, who lives in California, and Anna, who lives in North Carolina, were each the 100th participant enrolled in the Project Baseline study at their local study sites—Anna enrolled at Duke University School of Medicine and Justin enrolled at Stanford Medicine. Being the 100th is not all they have in common; Justin and Anna are also both 37 years old and both happen to be nurses. Their work in healthcare was a big part of what motivated them to join the quest to map human health. Ever since she was a little girl, Anna has loved helping people. She found her calling early in life when she took a class on health occupations in high school and realized that she wanted to become a nurse. Later, watching a family member struggle with several serious illnesses showed Anna the value of clinical research and prompted her to apply to join the Project Baseline study. Anna’s family history of cancer and cardiovascular disease makes her participation in the Project Baseline study especially interesting to researchers. “For me, as a healthy person, to be able to have these tests done and to know that the results will be used to help other people and further research and healthcare, that is amazing,” she said. When Anna isn’t working as a cardiac nurse, she can often be found helping patients at an adult daycare facility. “The geriatric population is my favorite, along with my cardiac patients,” she said. Justin too shares a passion for giving back and helping people. “One of the best jobs I ever had was being an aide in a special education classroom,” Justin shared. “I had the privilege of working with many resilient kids who had cerebral palsy, and that really sparked an interest in healthcare, service, and giving back to the community.” This experienced inspired him to become a cardiac nurse and, more recently, serve in an Intensive Care Unit. Justin also shares Anna’s appreciation for the unique approach of this study to better prevent and detect disease with the help of healthy people. As he said, “we focus too much on people when they’re sick and not enough on the transition.” Justin and his wife are expecting their first child soon, so his weekends and spare time are spent getting their home ready for this new addition to the family. Congratulations, Justin! The last thing that Anna and Justin share is proudly wearing their Study Watch, an investigational device designed by Verily, every day. 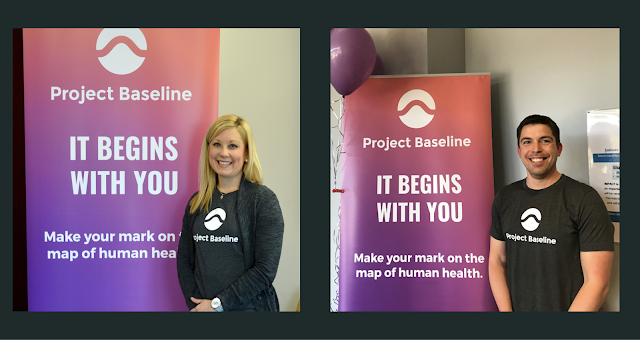 Justin noted that people often ask where he got it and he is excited to tell them about his participation in Project Baseline. It’s also one of the aspects of the study that Anna enjoys most. “It’s exciting to take new technology and use it to help find answers about how diseases progress in the body,” she said.